Today's dinner was kimchi (Korean pickle) soup. It was hot and tasty. It was very nice menu, especially on such a cold night. It warmed my body. The picture shows the cleaning of the Dome and the restoration of the course. We were informed of the next day's schedule at today's last meeting. All done today. It was so cold outside. We were told to get together in the Dome and I took pictures on the way to the designated point. It was about 10 o'clock. I was so tired but enjoyed the rally. 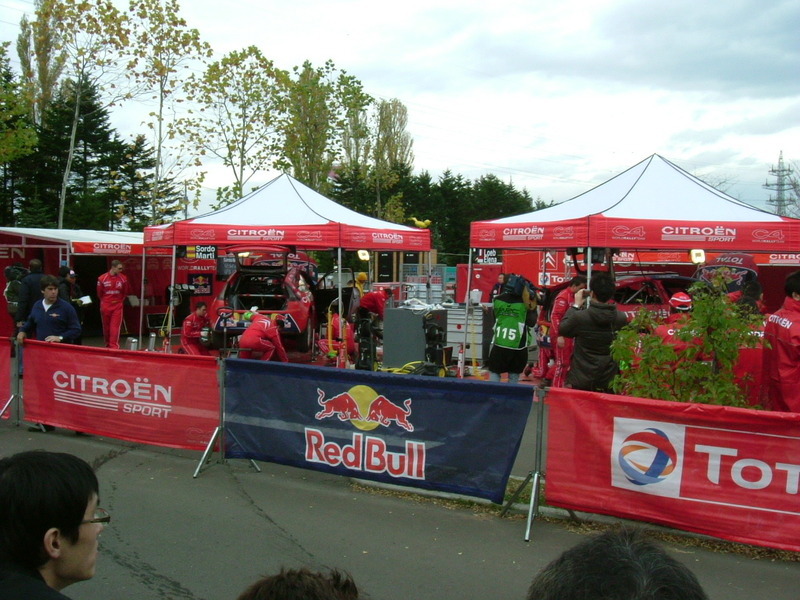 I could look at the WRC cars directly and enjoyed chatting with the WRC medias. 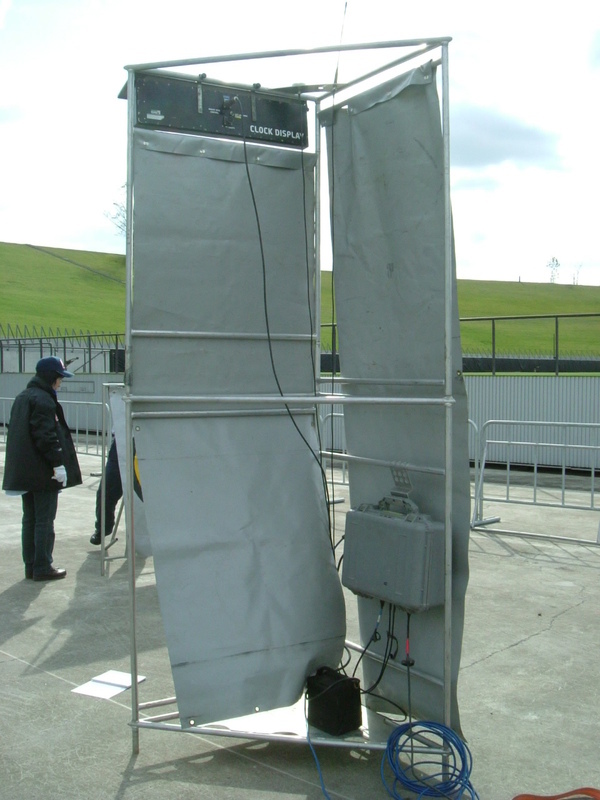 I knew how the videos of the WRC were recorded. 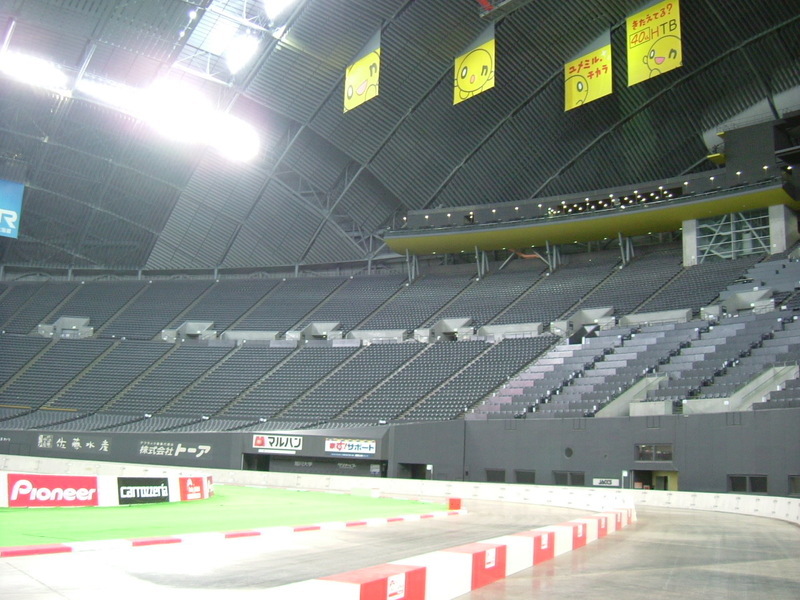 The second picture is the auditorium of the Sapporo Dome. I thought it was beautiful under the cocktail light. I worked here for about three hours. 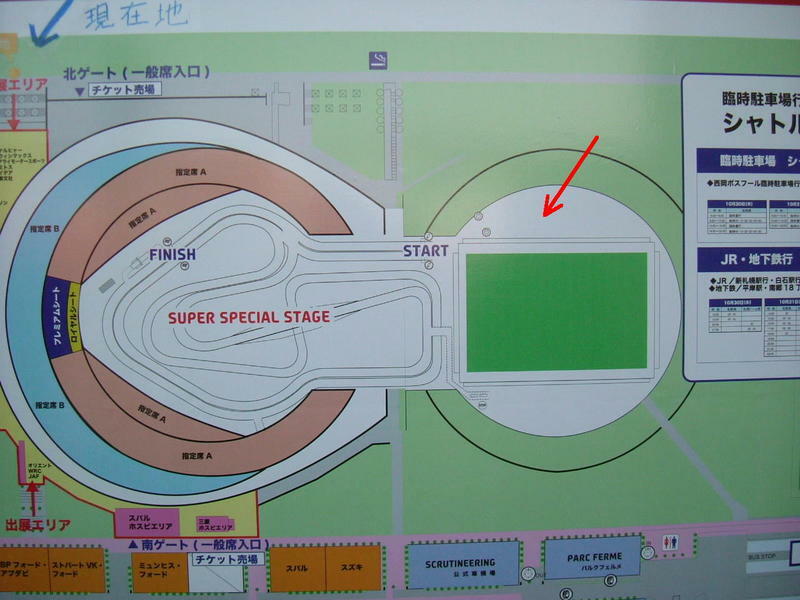 This point was only 100 meters away from the Dome, but I couldn't watch the Super Special Stage conducted in the Dome. It was really a shame, but this point had its merits. 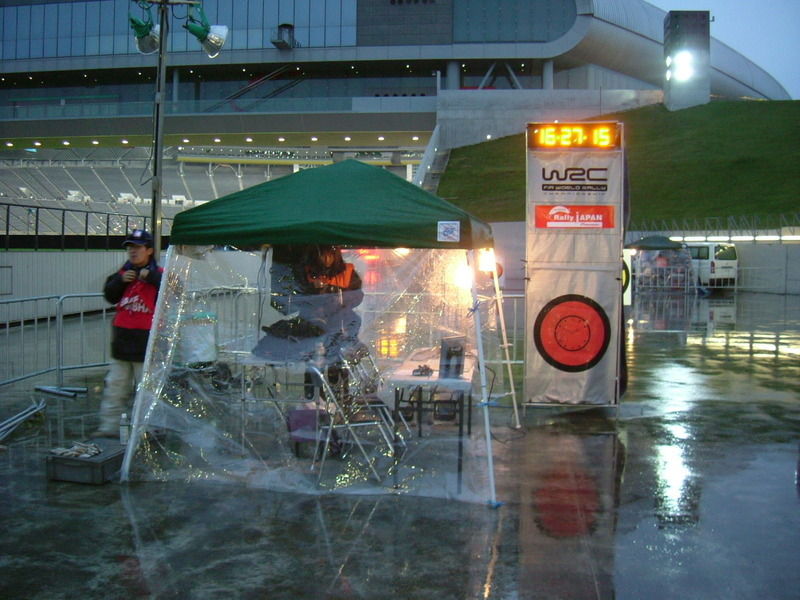 All rally cars gathered here and co-drivers got out of the car and dropped in at this tent to get the time control sheet that certificates the time of their pass-through. I could have the chance to talk with some world class co-drivers. 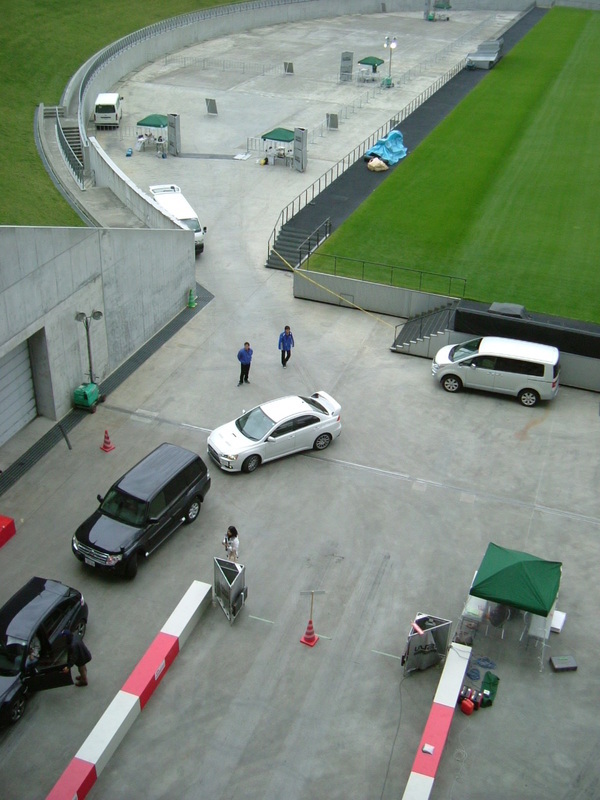 On the other hand, when I did the arrangements of the cars outside of the tent, I could also approach the cars and drivers. My co-workers were not so good at English, so when something urgent happened, I had to inform the drivers of the information. 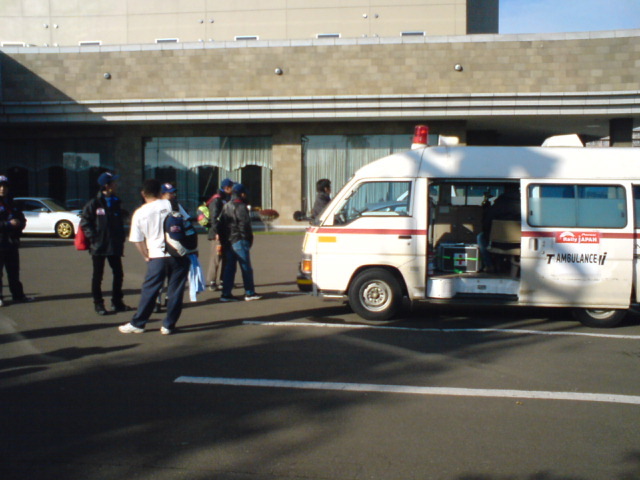 At that time, I could talk to the drivers. It was a great and exciting experience to me. I'm writing two episodes that happened today. 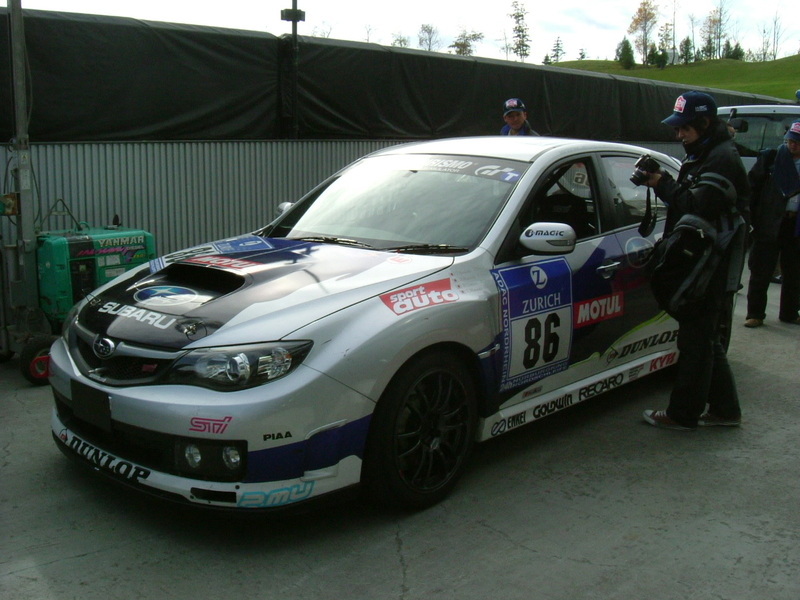 A famous Japanese movie star, Sho Aikawa (http://teamshow.net/blog/) was joining in the rally as a driver. I knew that when I saw his service team in the service park. He is about 40 and a nice looking guy. Guess what, I MET HIM here by chance. 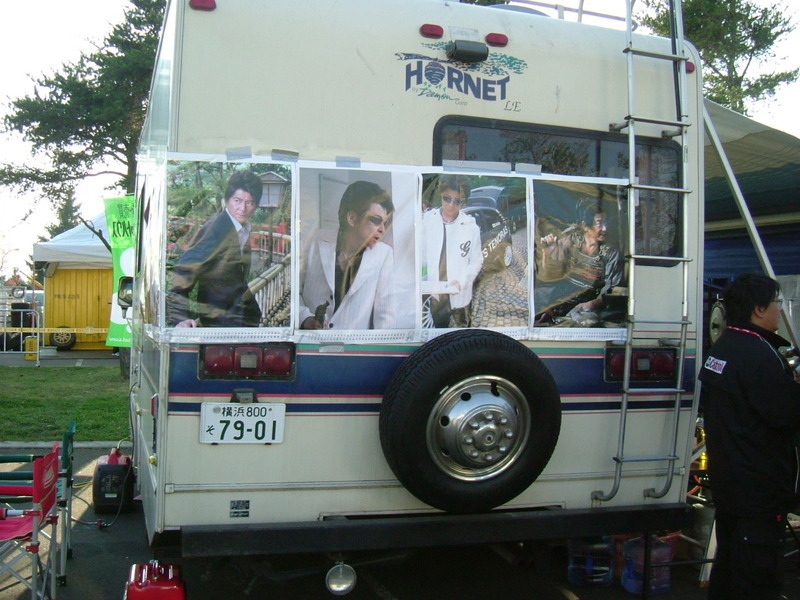 He got out of his car and rushed into the tent and said, "Where's the lavatory?" His face was expressing the urgent situation that he was confronted with. One more thing happened that I have to tell you about. I MET Mikko Hirvonen by chance near the toilet. I showed him the toilet. His face was light-skinned and looked younger than his age. I thought he was shy and modest. Some rally drivers including Japanese are supposed to be pushy, or have rude manners, but he wasn't like that. He was a gentleman. I'd like to talk about something with him, but I was a rally official and it was amidst the competition. I refrained from speaking to him. He asked me the location of the wash room and I answered. That was it. It started raining just after lunch. As the outside of the Dome was getting dark, the inside got light. I saw the brilliant lights of the stadium from my position, but I wasn't permitted to be away from my area. I could just hear the noise of powerful engines. The picture shows our lunch today. It was so simple, but filling. We call it "Udon." On the other hand, do you know the black sheet around the rice ball. I looked for the suitable word for you English speakers, but I couldn't find it in my dictionary. We pick seaweed that sticks to the rock in the sea and add some seasonings to it and next, extend it to the thinness of paper and dry it under the mild sunlight. "Nori" is made like this. 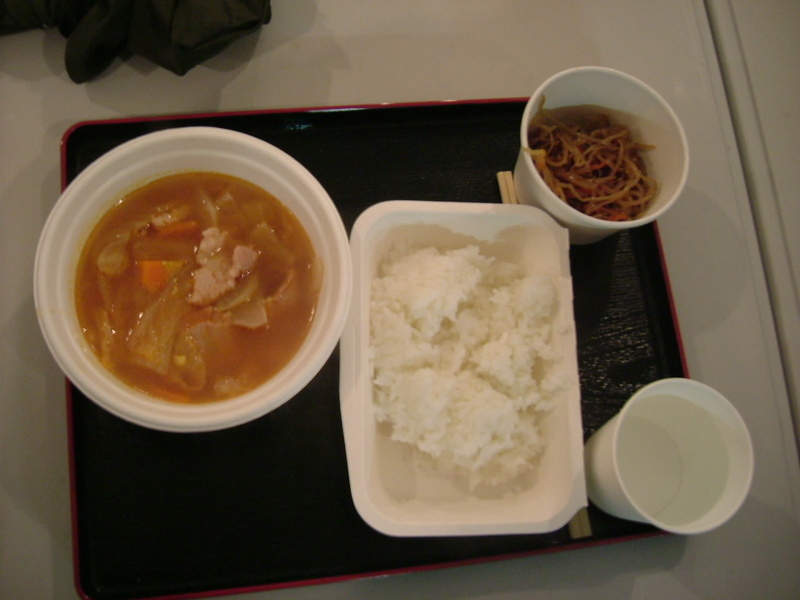 I know that Koreans eat this kind of food just like us. Do you know of another country's people who are fond of this food? In such an international event or convention, I often learn new English words. At that time, I sometimes understand the real meaning and usage of the words or phrases that have been memorized in the wrong way. 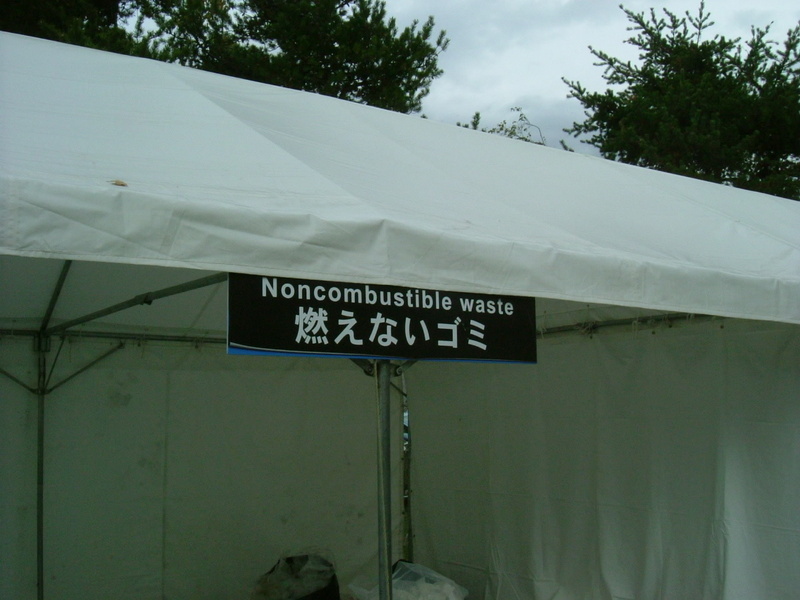 I didn't know the word "noncombustible" until I saw the signboard that is shown in the picture below. The separation of trash is obligated in Japan. We have to separate combustible from noncombustible trash. I don't know why, but as far as I know, the word "burnable/nonburnable" is more frequently used than "combustible/noncombustible" as the English translation in Japan. It seems that "combustible/noncombustible" is more popular in the U.S. according to my dictionary. Anyway, I shall use "combustible/noncombustible" opposed to "burnable/nonburnable". I found a car with an unfamiliar license plate. What country did it come from? If someone knows the answer, please tell me the country. 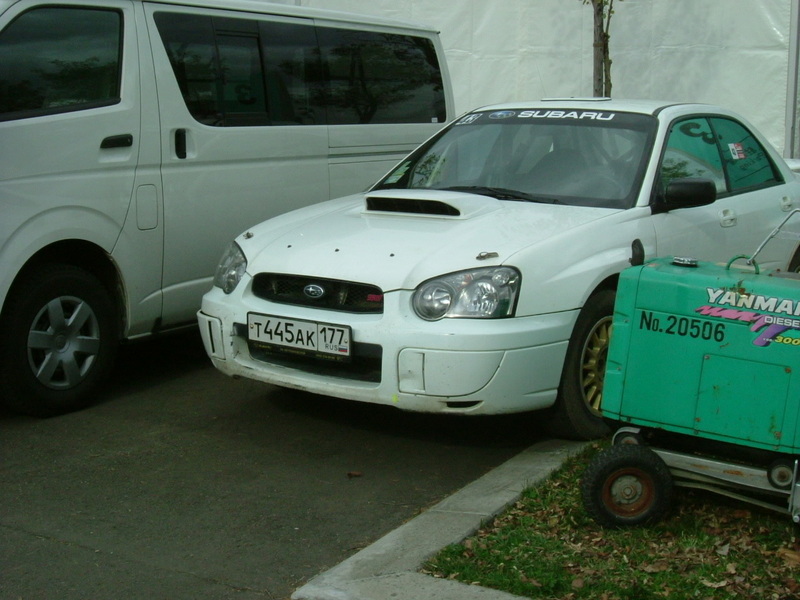 I suspected that this car was for the reconnaissance of the course of the special stages. 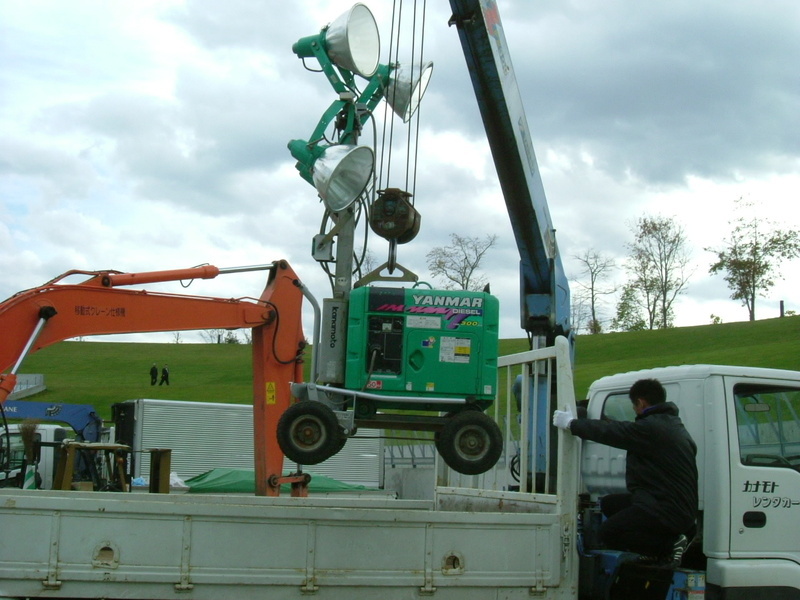 We got generators. That was it. I had a short break. I walked around the Dome and went to the eating house. 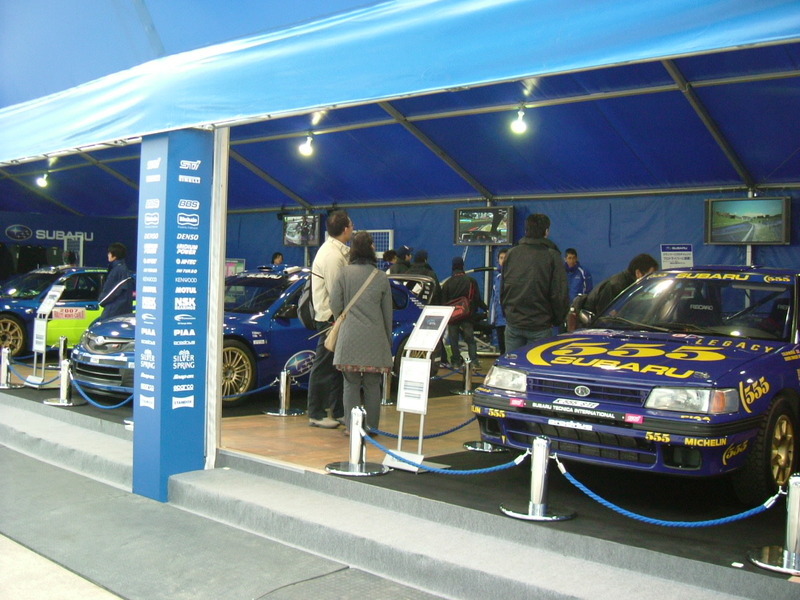 The booth of Subaru：. Lots of tiny goods were being offered to guests. I got small flags for free and bought two eco-friendly shopping bags (Eco-bags). 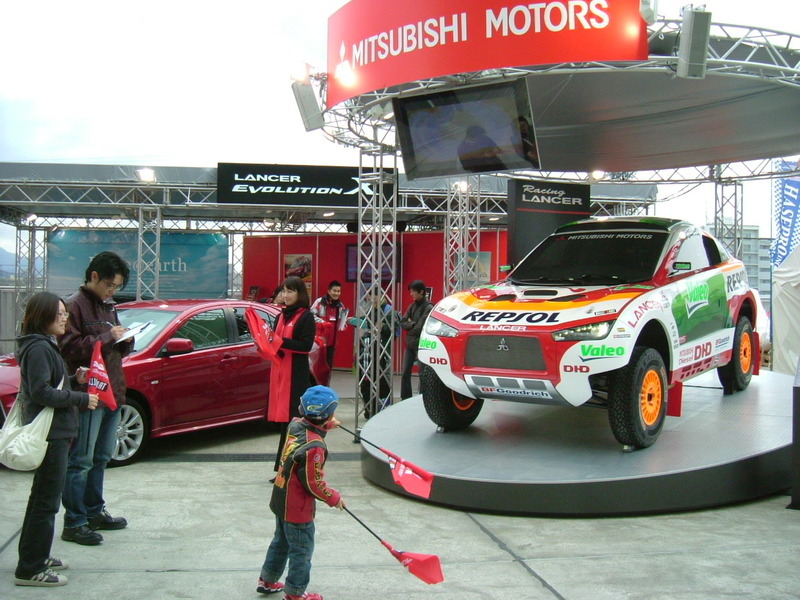 The booth of Mitsubishi: Mitsubishi was displaying the car for the Dakar rally raid (Pris Dakar Rally). 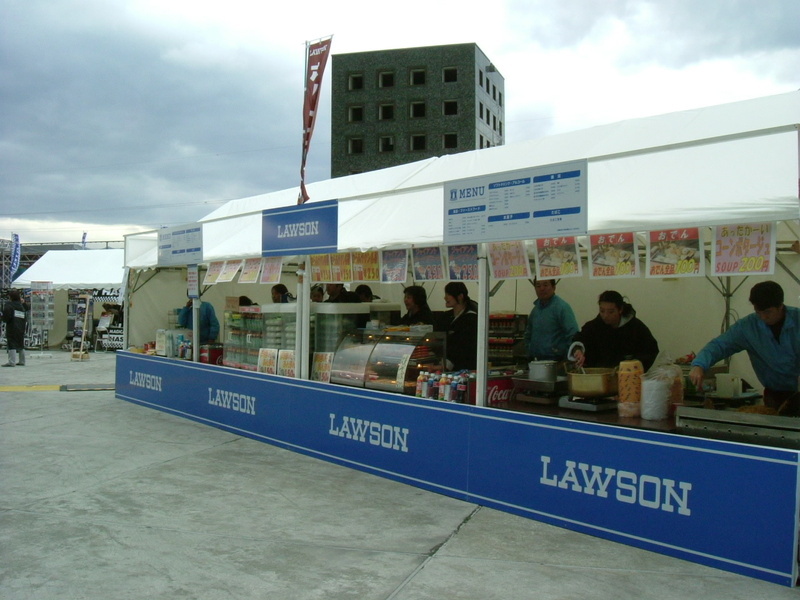 Lawson, one of the biggest convenience store chains in Japan, were selling hot meals. The audience in front of the Citroen Team. They were waiting for the No.1 driver, Christian Loeb. Citroen's service staff members were working on their cars. They might be the most excellent mechanics in the world. I wished I could understand French. 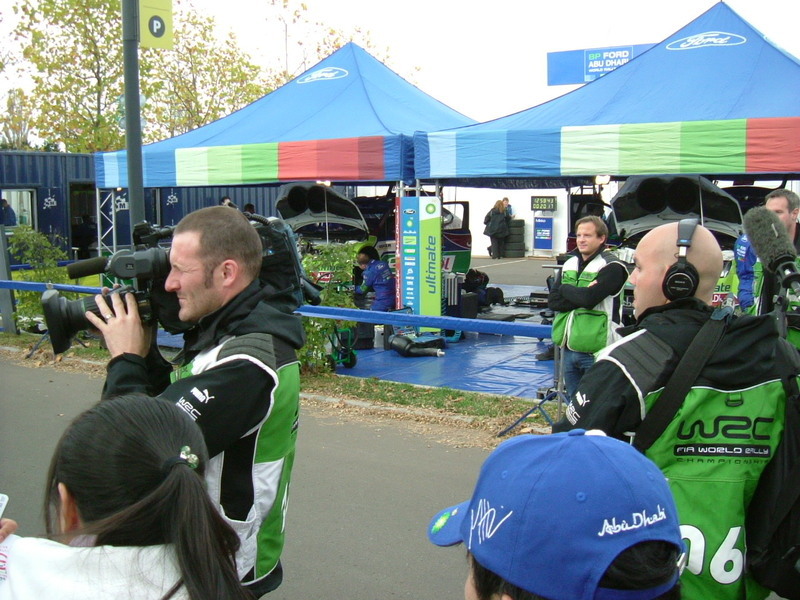 The media crew who was collecting news material from the galleries in front of the Ford Team. 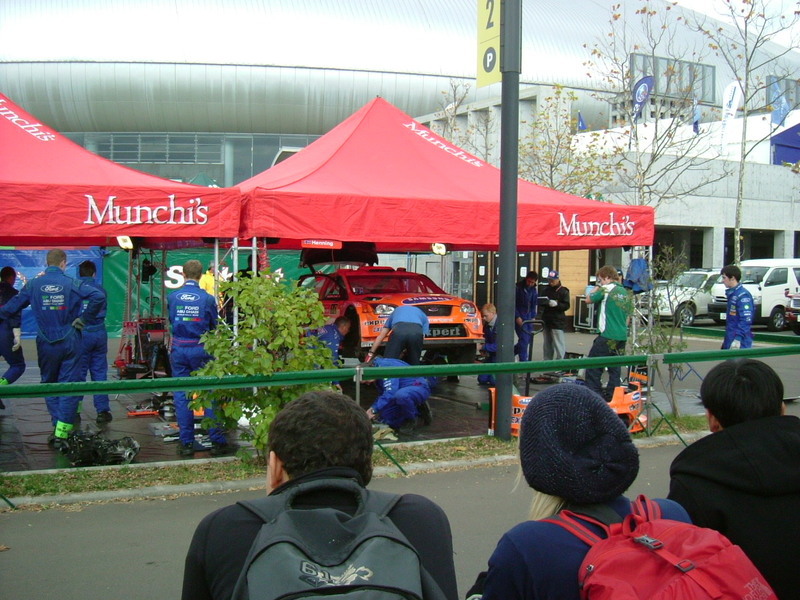 Munchi's Ford World Rally Team. 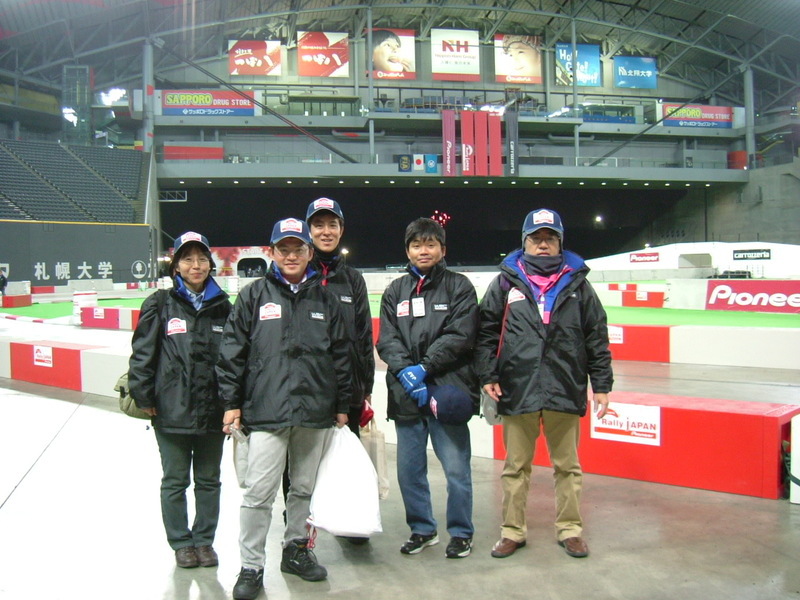 It is our Subaru Team. I was stuck at this point. 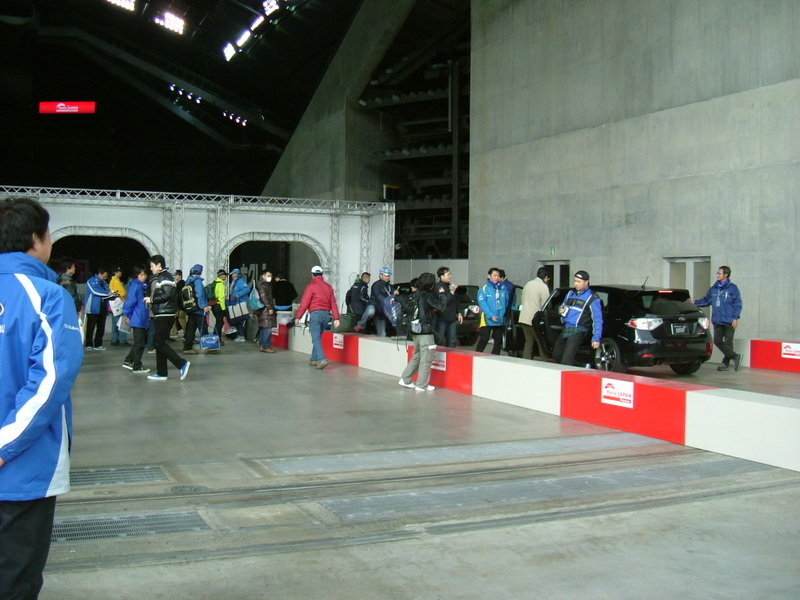 A Japanese car manufacturer, Subaru held a test-ride event in the Dome. I really wanted to join it, but I didn't want to waste my time waiting in line so long. 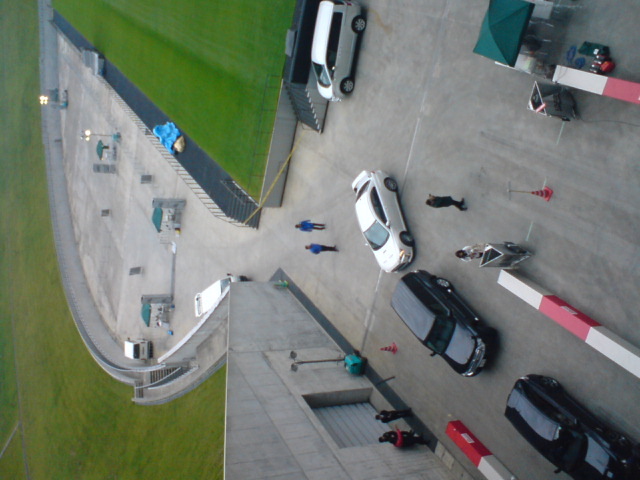 The black cars in the picture were Subaru Imprezas. They were so beautiful and powerful that I might get one when I change my car. An Australian middle aged man brought a small box to us. It looked dirty, caked with mud and made rattling noises. To be honest, I didn't want to touch it. I'll show you below. 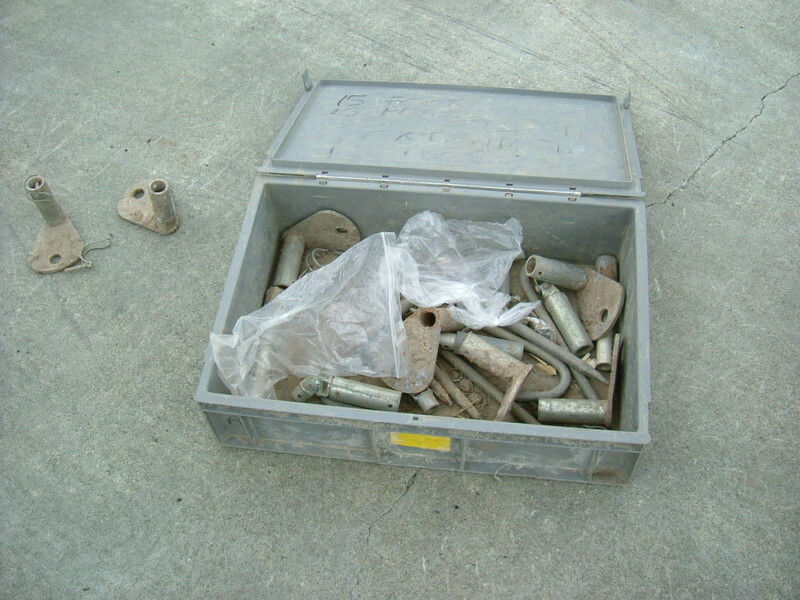 It was a box of small parts of the clock tower. When I was wandering about, I found the dump for waste oil. 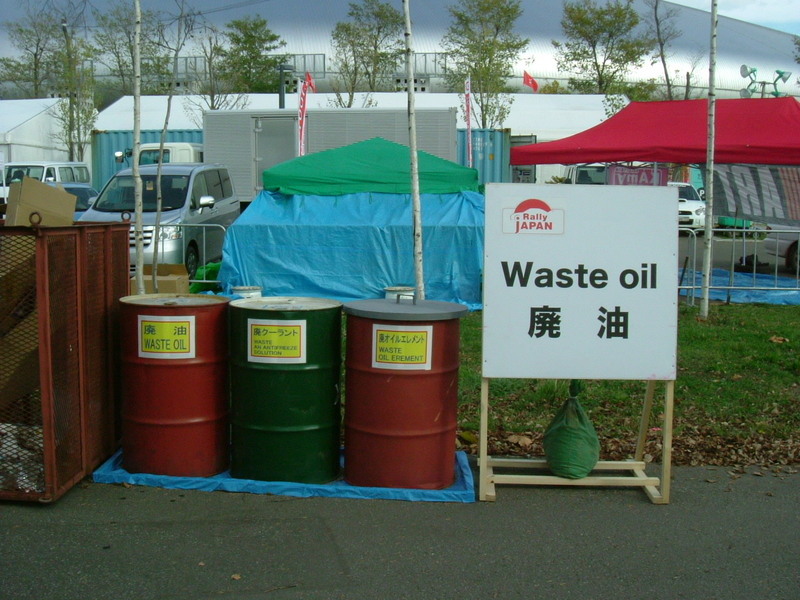 The labels on three drum cans read "waste oil", "waste antifreeze solution" and "waste oil element". I didn't notice that the dump was necessary until I saw it. Organizing the WRC was really tough, I thought. We started setting up our division as you can see in the first picture. 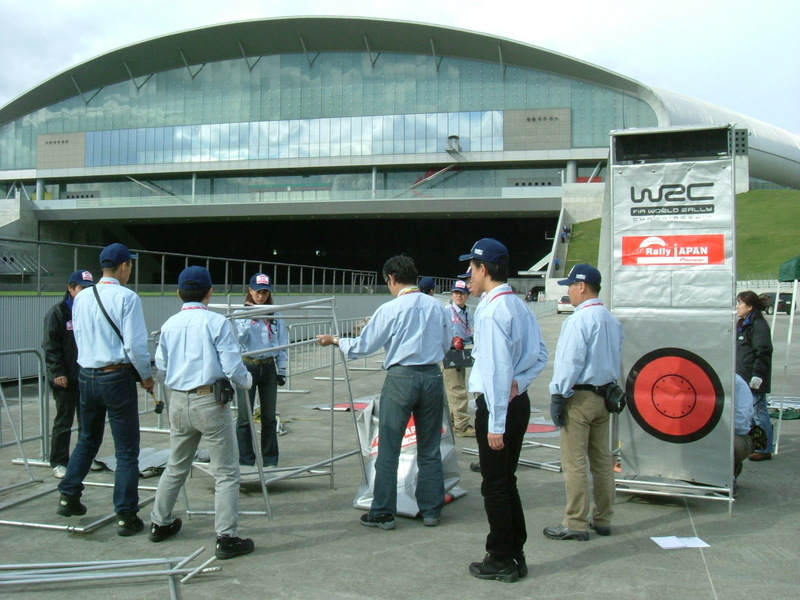 All this stuff was used in the WRC in every country and would be sent to Great Britain after the Japan Rally. I felt something deep with the building of the clock tower. In the second picture, the tower was built. I had sometimes seen this tower on TV, but I saw this for the first time in person today. The next picture was of the back side of the tower. It was simpler than I expected. The last picture shows the place where I worked during the rally. When I watched the rally on TV, I didn't notice the efforts behind the rally. I realized that there were some people in the spotlight and it indicated that others are out of the spotlight. 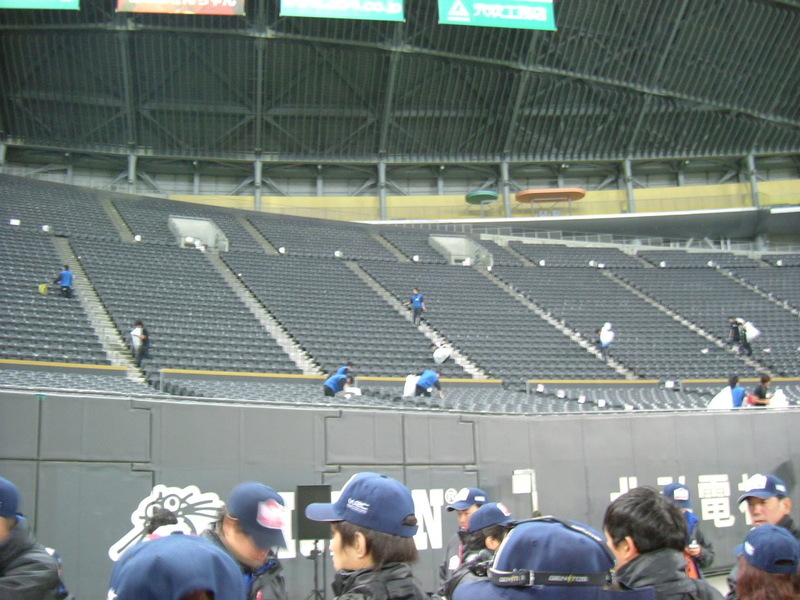 I took this picture at the opening of the Sapporo Dome toward the inside. If I were one of the audience who came to the Dome, I would never see the view from here, I thought, and took the pictures. I'll show you one of those. A few rally officials of this part were preparing the special stage. 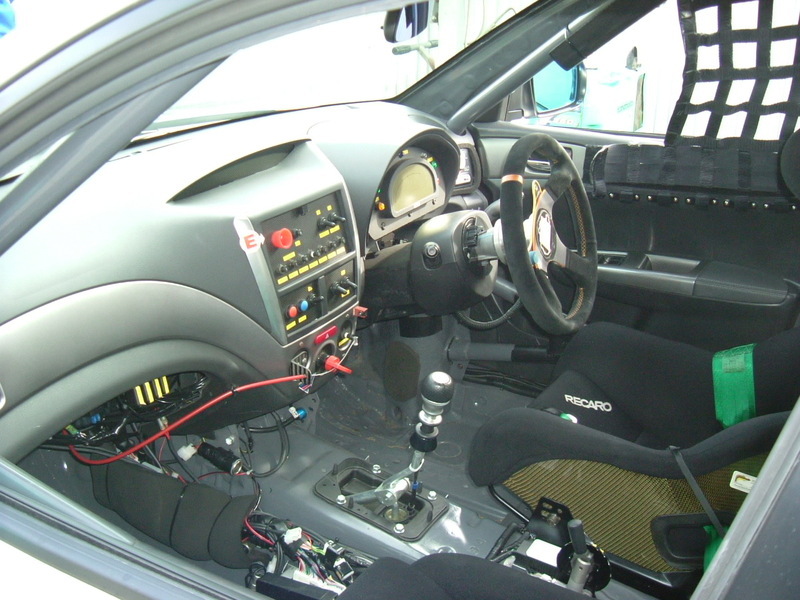 I found a Subaru-made car built for the 24 Hour Nuerburgring (http://www.nuerburgring.de/) by chance. 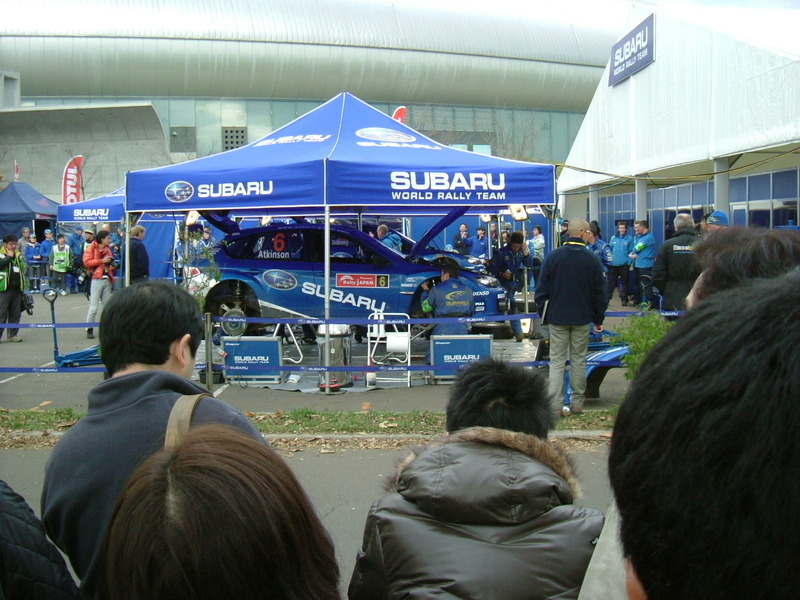 It seemed like Subaru, the famous car manufacturer, was going to show the customers their technology. I'll post pictures of the car below. 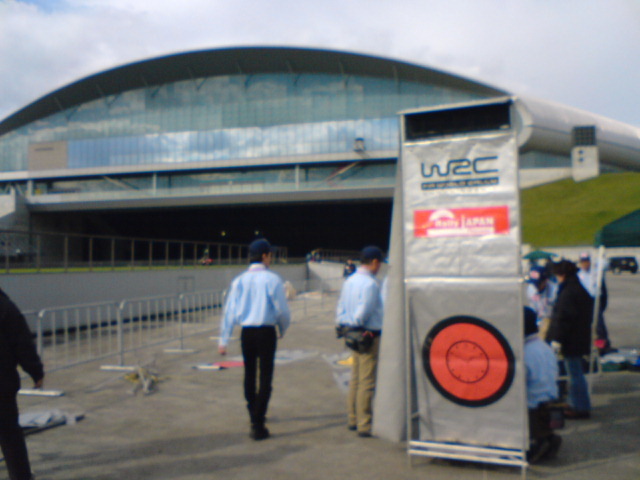 By the way, the rally cars were supposed to gather here about 6 o'clock in the evening. 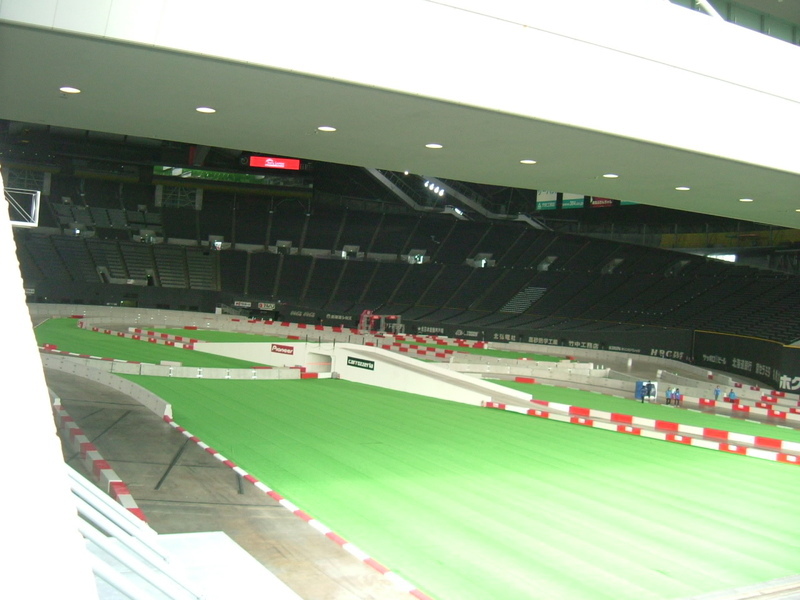 That meant that the racing course specially designed in the Dome was vacant in the daytime. 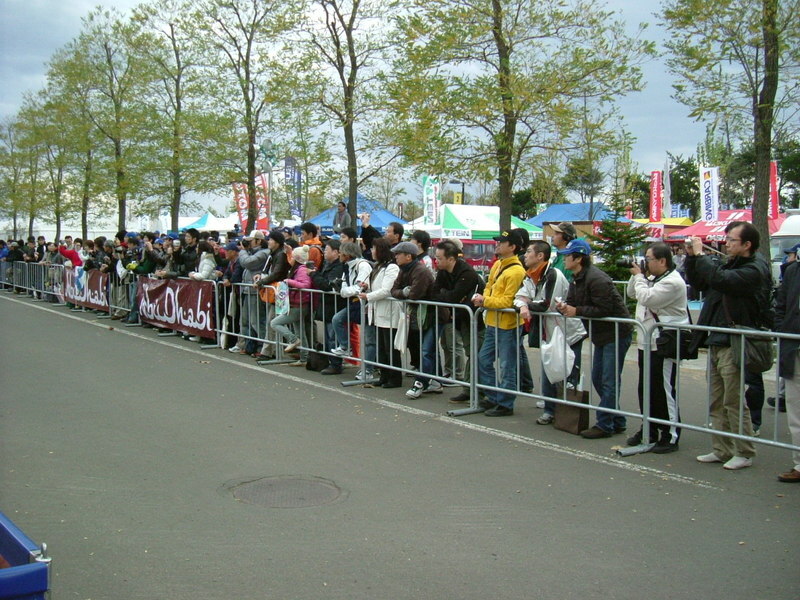 Subaru held a test-ride event for three days using this course in the daytime and a few hundred people participated it. 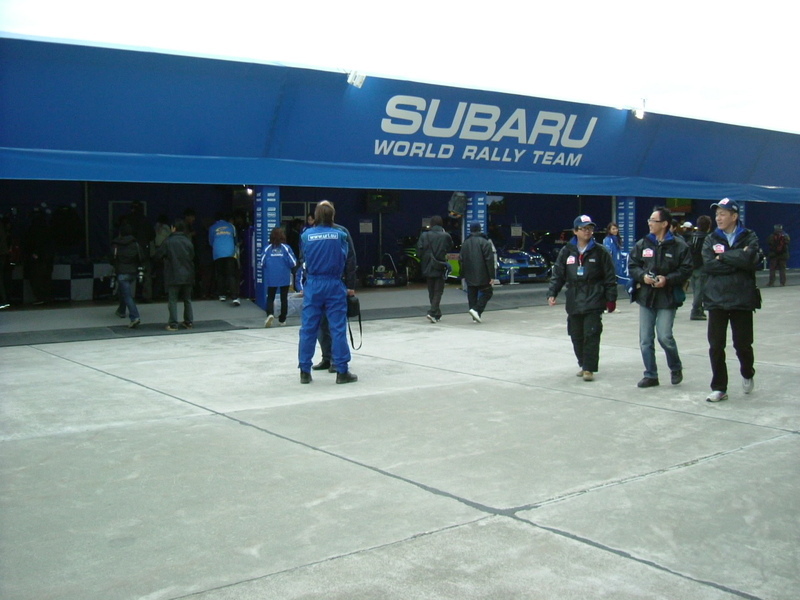 They seemed to enjoy the Subaru cars that were driven by professional racers. 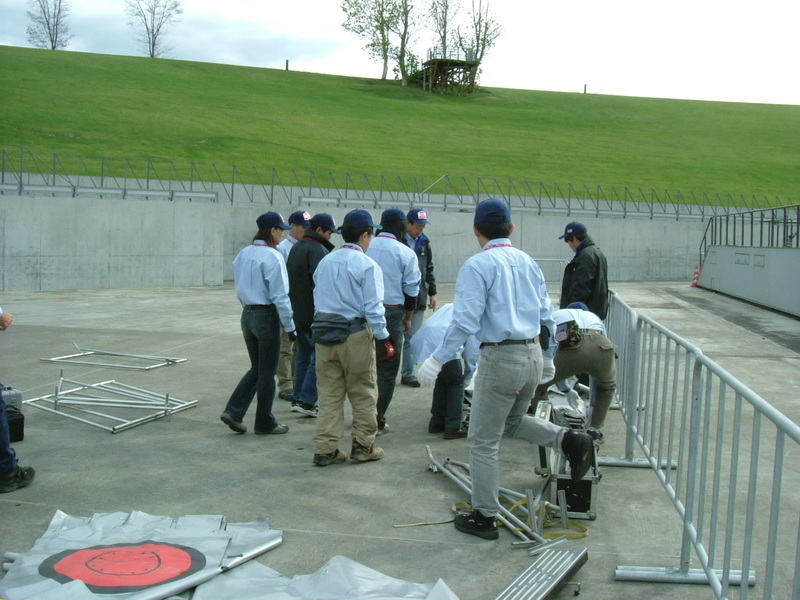 The picture shows part of the opening of the Sapporo Dome through which the soccer field or the baseball field is pulled into the Dome. 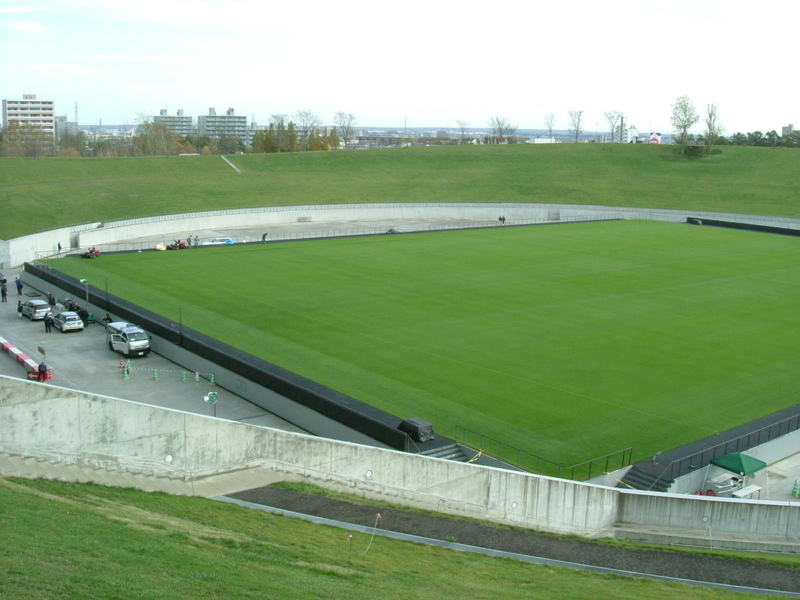 The left side of the picture is the Dome and on the right you can see the natural grass field for the soccer game. 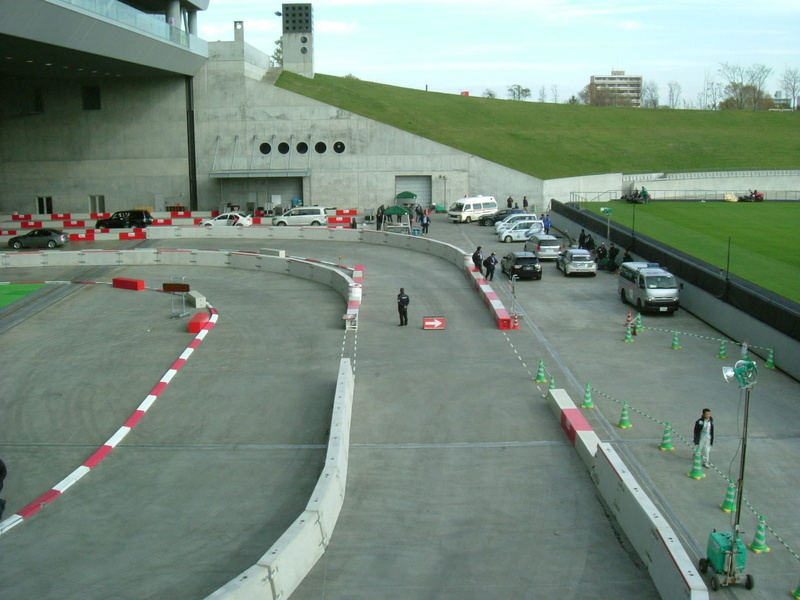 The center of the picture is a part of the course of the Super Special Stage of the competition. This part has no roof and if it rains the surface gets more slippery. When I got to the course, the sky was getting cloudy and I thought some cars might crash here due to the rain. 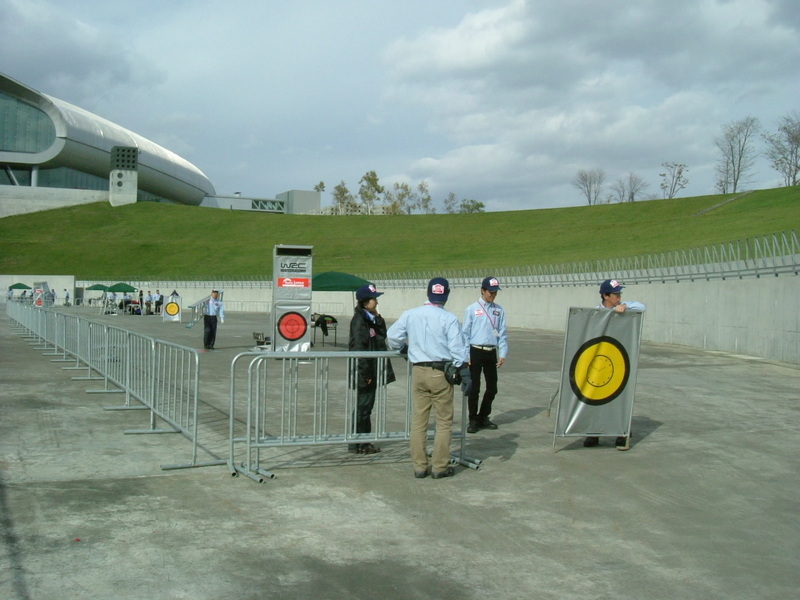 I hope you can figure out the design of the Sapporo Dome by referring to the pictures of the last entry. 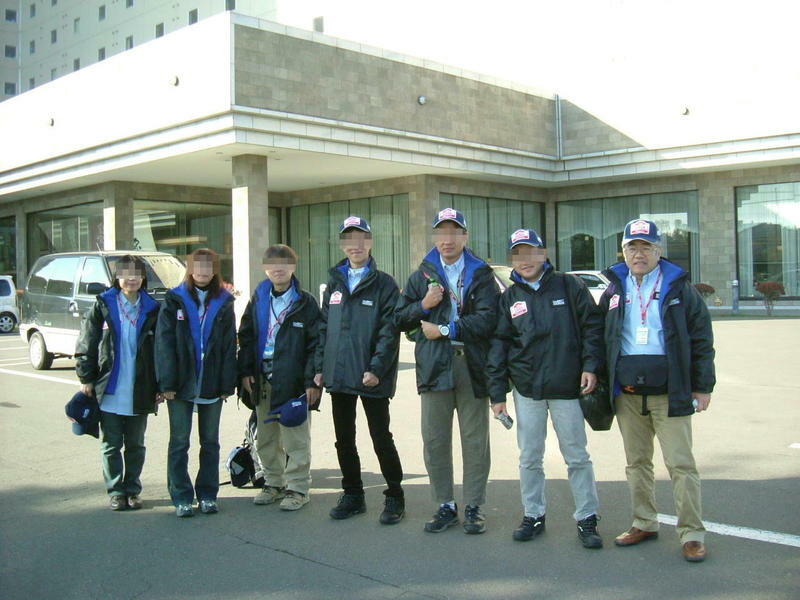 I got to the point where I would work on the arrangements for the rally cars going back to the Sapporo Dome after the competition in the forests in the daytime. 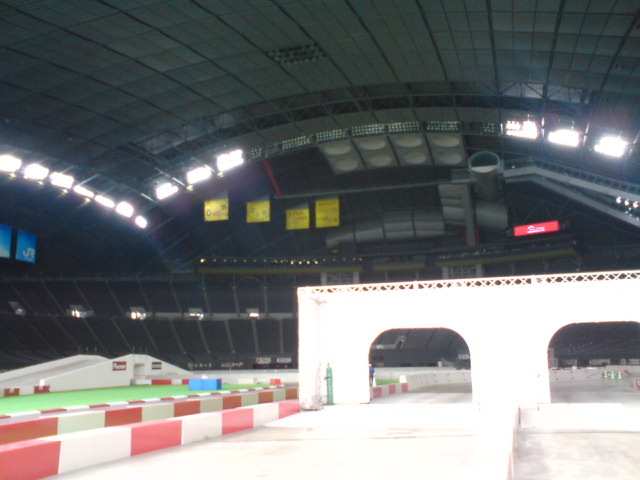 I'll show you three pictures below so that you can figure out the structure of the Sapporo Dome and my working area. The first picture was taken behind the Sapporo Dome. I hope you can make out the image of the Sapporo Dome referring to the next picture. A red arrow in the picture indicates my working area. The last picture was taken the next day and shows the area that the red arrow indicates in the second picture. 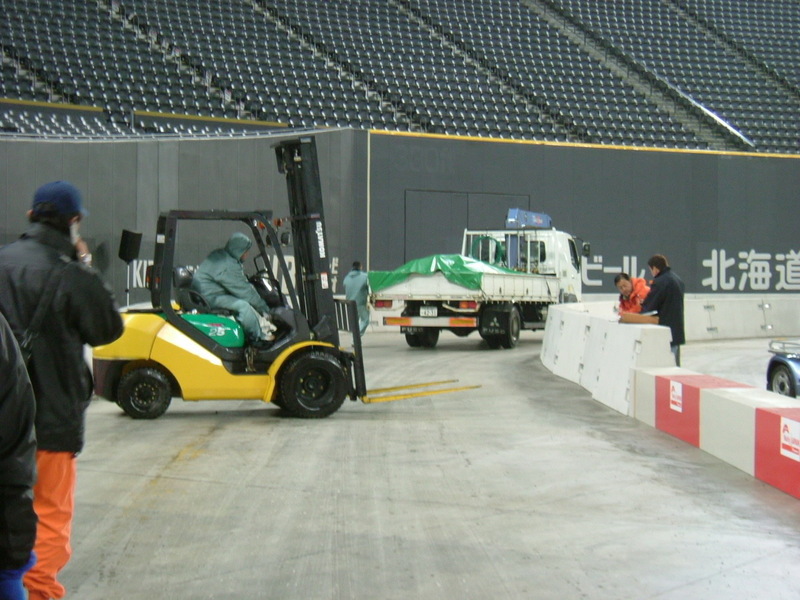 My job was to get the cars here and make them start as scheduled into the Dome for today's last competition. By the way, do you know what the rectangular lawn is for? This lawn is natural grass and becomes an official soccer ground under the Dome. 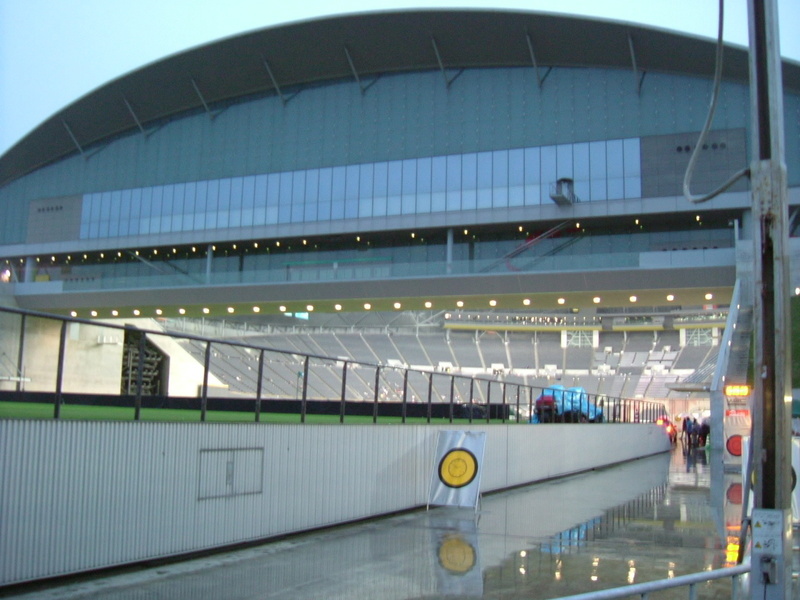 As I wrote before (http://kumo.typepad.jp/weblog/2008/10/post-b8f2.html), this Dome is the home of Nippon Ham Fighters and additionally is also the home of Consadole Sapporo, a Japanese Professional Soccer Team (http://www.consadole-sapporo.jp/). The rectangular lawn has a two layer structure; a baseball ground made of artificial grass is set under this natural grass ground. Rally officials were provided with all their meals during the Rally. I had been afraid before flying into Hokkaido that boxed meals would be cold. It would be difficult to keep them hot in the cold air of Hokkaido. I heard about the catering service, but I thought it meant that someone would deliver boxed meals to every point where the rally officials were working. However, it was not true. It was no use worrying. The organizers were professional. 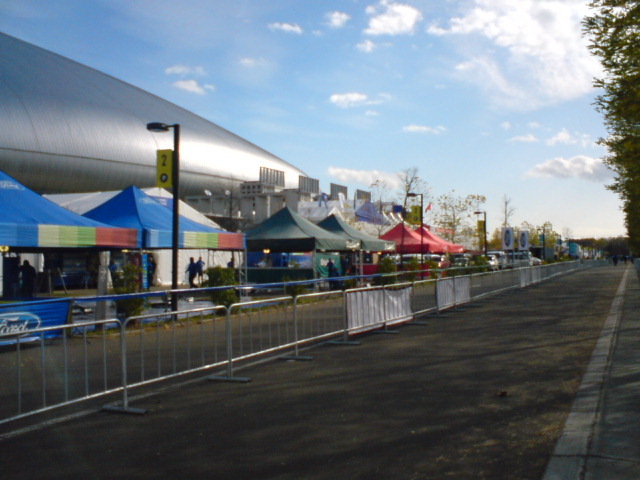 A large tent was prepared as an eating place. 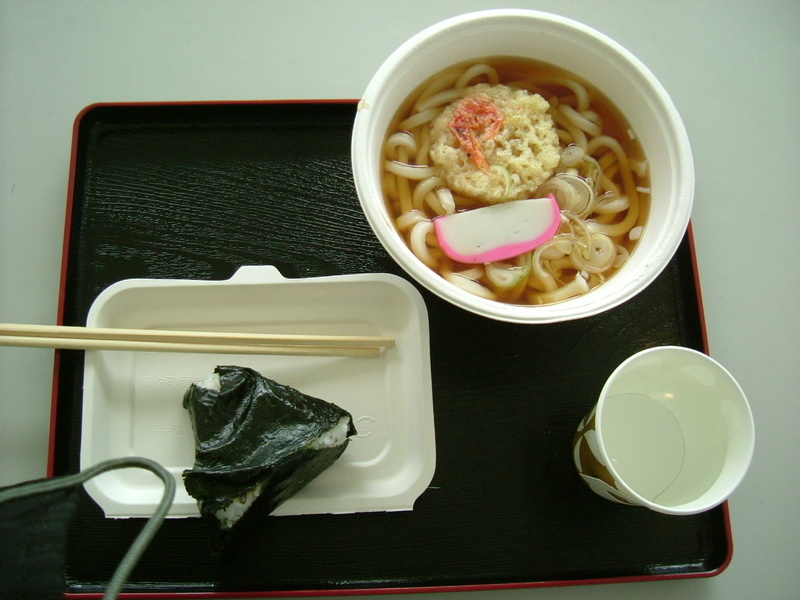 The first picture shows the breakfast on Oct. 31st. Scrambled eggs and kelp boiled in soy sauce were on the rice. We named it the bowl of double colors. 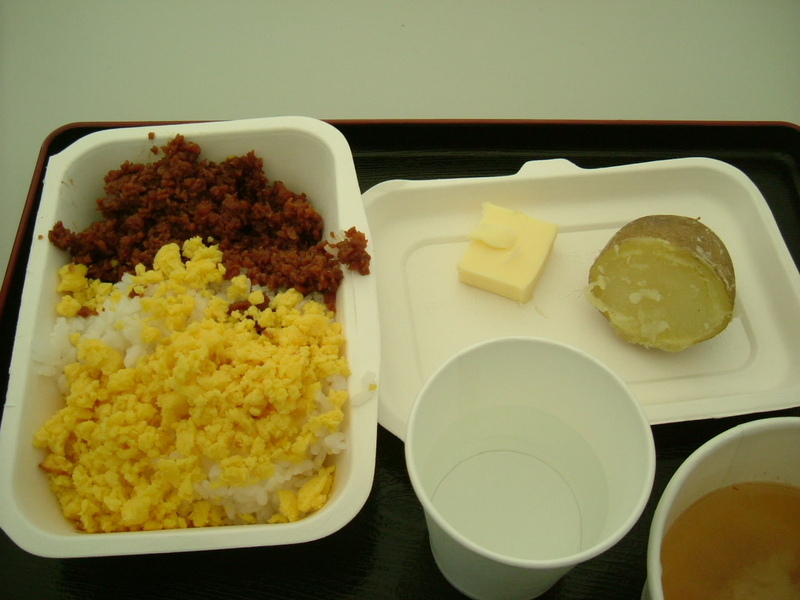 Steamed potatoes with butter was one of the famous foods in Hokkaido. 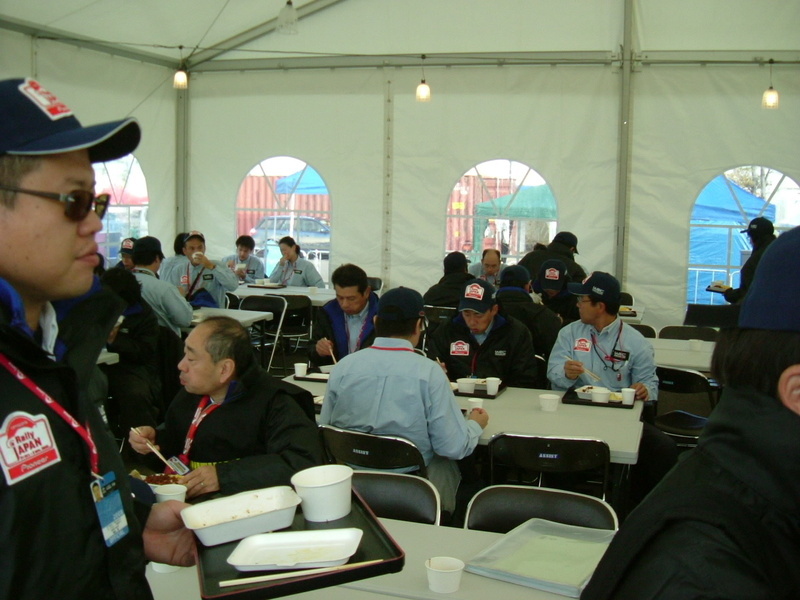 The second picture shows the catering service men. As you see, they wore the same uniform as me. They were also rally officials. These catering staff members seemed to be dispatched in the forest where the special stages were designed. I wondered how systematic and meticulously scheduled the official side of the rally was. The last picture shows the inside of the tent. I finished the breakfast. The time has come. I'll do anything that I have to do. I hope I will have the chance to talk to worldclass famous drivers. At 8:30 in the morning. We gathered in the lobby for a roll call. Nobody overslept. 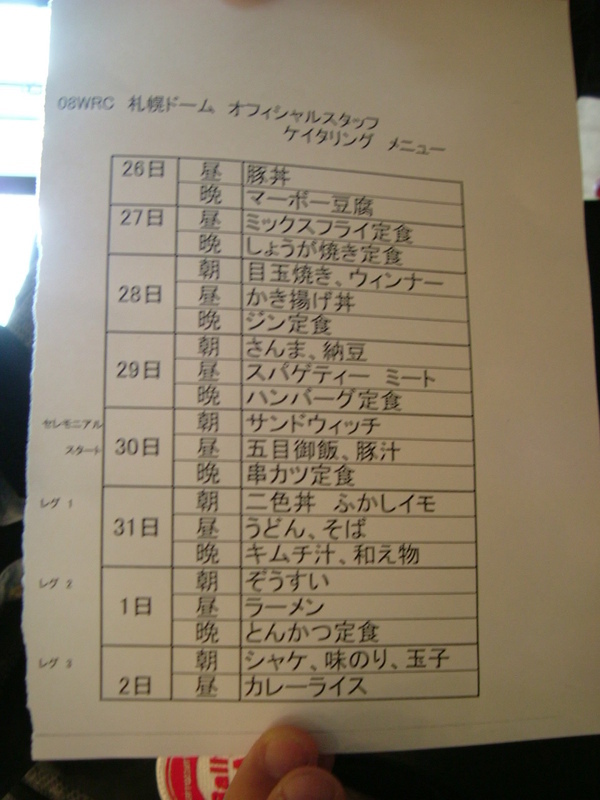 The second picture shows the menu. 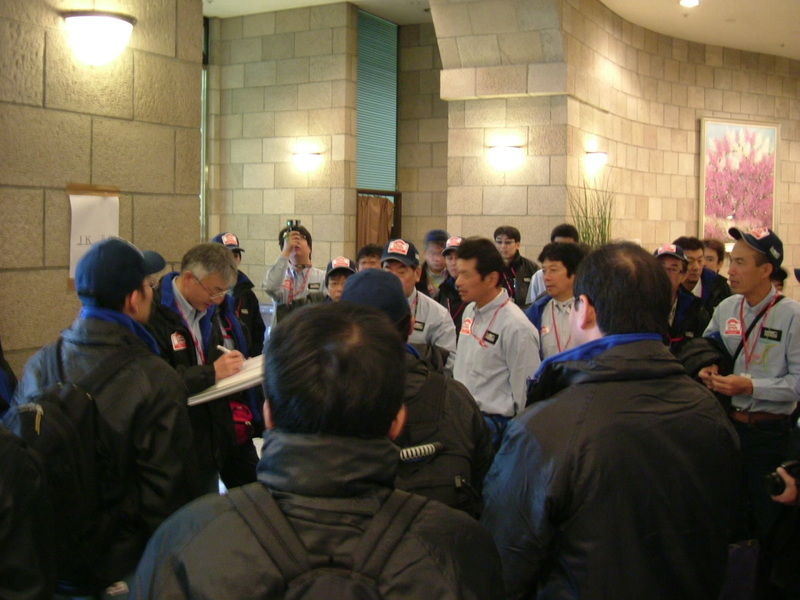 During Rally Japan, rally officials were provided with a free catering service. I'm going to show you some dishes later which were simple but not bad.